Travel back to a time when the Mafia ruled the streets. Click here to play! Join Big Tony's gang and you'll be handsomely rewarded as you avoid the fuzz while pulling in big money heists! 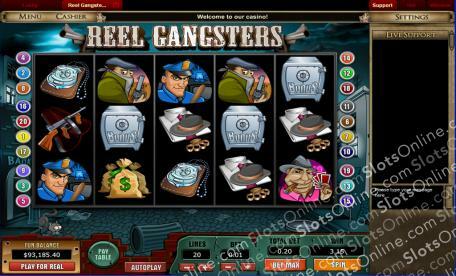 You'll need to be packing heat in this slots game, so be sure to spin in as many pistol symbols as you can. This symbol is a wild and will help you bring in more wins. It will also pay out up to 10000 times your line bet if you spin five of them across an active payline. Always do what Big Tony says. Spin two to five of this boss and you'll bring in up to 1000 times your line bet. Two to five babes will get you 500 times your line bet. Also watch out for Cops, robbers, card sharks, moneybags, badges, tommy guns, and gangster clothes to really bring in all of the big wins. You'll want to keep up on the headlines, so you'll have to spin in newspapers. These scatter symbols and you will get up to 25 free spins. Also bust a few safes in this gangster themed game. Spin three to five bonus safes across the reels and you'll trigger a bonus game that gives you even more chances to win big! Live the life of a Mafia henchman and you might just see yourself bringing in plenty of big wins. The newspaper acts as a scatter. Spin three or more of these anywhere on the board to get up to 25 free spins. The pistol is a wild symbol. Not only will it replace most other symbols (excludes scatters and bonuses), but it will also bring in up to 10000 times your line bet. Spin three or more bonus safes on an active payline and you will trigger a bonus round. During this game you will go through several rounds of play in which you will have to choose the right items to pull of a bank heist. Each item you choose will award you with a bonus prize. The game ends if you choose the wrong item or when you pull off a successful heist.